Dubrovnik is a beautiful stone jewel hugging the Adriatic Sea. This picture-perfect medieval walled city offers ancient stone buildings, narrow cobbled streets and fortified ramparts rising above red-tiled rooftops. 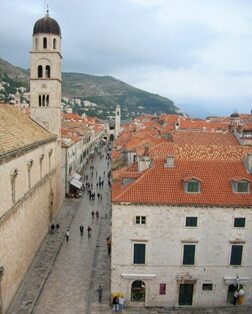 Stradun is the city's focal point and main artery while Dubrovnik's streets are blessedly free of vehicular traffic. Despite the heavy damage inflicted by shelling in the early '90s, Dubrovnik has been restored to its pre-war beauty. A UNESCO World Heritage Site, the old city remains the pride of the Republic of Croatia. For six centuries Dubrovnik was an independent republic - an oligarchy ruled by patrician families. The Republic was overthrown by Napoleon in 1808. Note: All passengers must carry an original photo I.D. when going ashore: photocopies are not accepted. On occasion, Dubrovnik will be an anchorage port; passengers transfer to shore via ship's tender. The gate is this UNESCO World Heritage Site's traditional entrance. Once inside, you'll find a wide marbled pedestrian boulevard and the 15th century Onofrio Fountain among other historical monuments. This 14th-century complex offers Romanesque and Gothic cloisters, a museum and one of Europe's best manuscript libraries. The pharmacy is believed to be the oldest working apothecary in the world. The monastery may look like a fortress, since it was built at the same time as the city walls. Inside, however, you'll find a fine collection of Renaissance art including frescoes by Paolo Veneziano. This 15th-century palace mixes both the Gothic and Renaissance styles. Inside you'll find a vast collection of artifacts, paintings and furniture dating back from the time of the Dubrovnik Republic. Among the wonders inside this 1673 Cathedral are a number of masterpieces, including Titian's The Assumption. The treasury itself features an opulent collection of gold and silver religious relics. Walk the circumference of these 13th-century walls for some spectacular views. The museum, located in St. John's Fortress, features models and artifacts relating to this important maritime port. Cavtat's name comes from its ancient origins and link with Dubrovnik. One of the most romantic villages on the Dalmatian Coast, it was the honeymoon spot for Edward VIII and Mrs. Wallis Simpson. Trsteno is home to one of the oldest arboretums in this part of the world. You can also see the 300-year-old Fountain of Neptune and a medieval oil mill. Ston and its valuable salt pans are still protected by one of the longest stone walls in the world. Experience the unique folklore and tradition of this part of the Dubrovnik Riviera. The area is filled with beautiful contrasts--mountains and valleys, green hills and naked stone, and over 30 villages.